ComicsPRO, the trade association for comics specialty retailers, proudly announces the nominees for its annual Comic Industry Awards. The awards honor those people who are or have been the best at what they do, making a significant difference in the business of the comic-book specialty market. The BOOM! Studios Team has instituted what is considered by many retailers to be the gold standard retailer partnership program in the industry featuring affidavit returnability, additional promotional material, and early first looks at upcoming projects. Steve Geppi is a comic book distributor, publisher and former comic store owner He is best known for his distributing business - Diamond Comic Distributors, the largest comic direct distribution service. He also owns Gemstone Publishing, the publishers of the annual Overstreet Comic Book Price Guide. Jonni Levas is a former comic book distributor. In the 1970s with her partner Phil Seuling, she founded Sea Gate Distribution. Seuling and Levas developed the concept of the direct market distribution system for getting comics directly into comic book specialty shops, bypassing the then established newspaper/magazine distributor method, where no choices of title, quantity, or delivery directions were permitted. Margaret "Maggie" Thompson is a science fiction fan, collector of comics, early fanzine writer/editor and long-time editor of Comics Buyer’s Guide. She and her late husband Don Thompson were among the pioneers of comic book fandom. Gene Luen Yang: The first graphic novelist to be named The Library of Congress' Ambassador for Young People's Literature, Gene is also a recipient of a MacArthur Foundation “Genius” grant and is the creative force of many graphic novels including American Born Chinese and the Secret Coders series, as well as the co-creator of DC Comics' New Super-Man. Batton Lash was a comics creator who came to prominence as part of the 1990s self-publishing boom. Batton was best known for the series Wolff and Byrd, Counselors of the Macabre (later called Supernatural Law), a comedic series about law partners specializing in cases dealing with archetypes from the horror genre, which ran as a strip in The National Law Journal, and as a stand-alone series of comic books and graphic novels. Bill Liebowitz was a comic store retailer (Golden Apple Comics), a yo-yo champion in the 1950s, a co-founder of Rhino Records, and had recurring roles as himself in Archie Comics. Based in Hollywood, Liebowitz was well known for hosting signings by comic book artists and writers, for helping grow the yo-yo scene in Southern California, for his anti-censorship activism and for being one of the prominent “faces in the media” for comics in the ‘80s and ‘90s. Bill was also co-founder of the Direct Line Group, an early retailer lobbying association. Don Thompson was editor of Comic Buyer’s Guide, the foremost news source for the comics’ industry in the pre-internet days. He and his wife Maggie were early producers of fan magazines, including Harbinger, Comic Art and Newfangles, and was a pioneer of comics' fandom in the 1960s. Major Malcolm Wheeler-Nicholson was a pulp magazine writer and entrepreneur who pioneered the American comic book, publishing the first such periodical consisting solely of original material rather than reprints of newspaper comic strips. Long after his departure from the comic book company he founded, Wheeler-Nicholson's National Allied Publications would evolve into DC Comics. "The ComicsPRO Industry Nominees have done so much for comics and for comic retailers," said Peter Dolan, ComicsPRO's President. "ComicsPRO and its member retailers appreciate what these creatives and business professionals have done for the industry." ComicsPRO members will vote on the nominees with the results announced at the 2019 ComicsPRO Comic Industry Conference in Charlotte, NC on February 21-23. The ComicsPRO Annual Comic Industry Conference, the industry's only retailer directed trade event, is recognized as the most important annual comics' business gathering in the industry. Retailers, publishers, distributors and vendors gather to discuss major industry issues and to chart a course for improving the comic book specialty market. All retailers and vendors are invited. 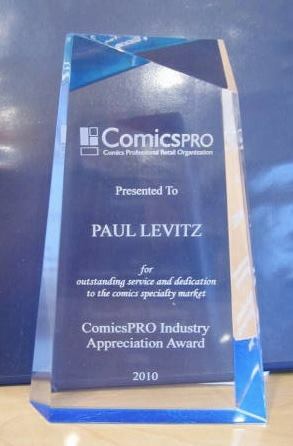 Please visit www.comicspro.org for more information about the conference and how to register as a retailer or a vendor. ComicsPRO is the comic industry's non-profit trade association dedicated to the health and progress of direct market comic book retailers. ComicsPRO allows retailers to speak with a unified voice on important industry issues, provides educational and mentoring opportunities to current and future retailers, and provides ways for members to reduce the fixed costs we all incur.